The PushManager Mobile Device Management solution allows you to remotely configure a heterogeneous fleet of smartphones, tablets and laptops. It also allows you to intervene remotely at any time on a device or a group of users and to have comprehensive, detailed inventories of your fleet. The PushManager solution allows you to manage different configurations and access rights, depending on the people concerned, by creating user groups (e.g. by activity or level of responsibility…). in bulk over the entire fleet: you can configure all mobile devices simultaneously, no matter whether you have hundreds or thousands of devices to administer. There are 3 user integration modes in the platform: import the global list of users from Active Directory, import a list in CSV format,create the new user directly into the platform. the user can register his own device via a url sent to him. The device is automatically recognized as a personal device and receives the proper configuration for this type of device. The DEP (Device Enrollment Program) is part of Apple deployment Programs (ADP) that help businesses and schools to easily deploy and configure iOS devices. This program which greatly simplifies the device enrollment for users and administrators console also makes it possible to manage them remotly. This means that a user can not delete the profile (access, restrictions ...) that you have assigned. At any time you or your staff (if you have authorized them) can work remotely on a smartphone, tablet or laptop. You can take action on the choice of a user, a user group and / or the whole fleet. You have the option to delete only company data. In this way the user will keep his/her personal data (photos and emails…). PushManager gives you an overall, detailed view of your fleet of devices. the list of applications installed on a device. You can have pre-formatted reports and can export the data available to set up your own reports (word, excel and pdf formats). 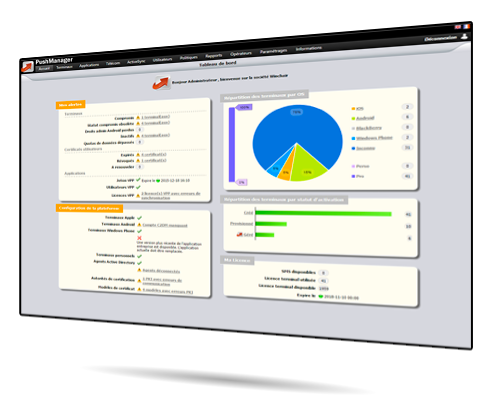 Your reports are enriched with information sent directly to the platform during deployment (e.g. : IMEI° N°).